Three Sprint Cup drivers who have had less than wonderful 2015 seasons earned the right to sport smiles late Friday night as they earned entry into Saturday night’s Sprint All-Star race at Charlotte Motor Speedway. 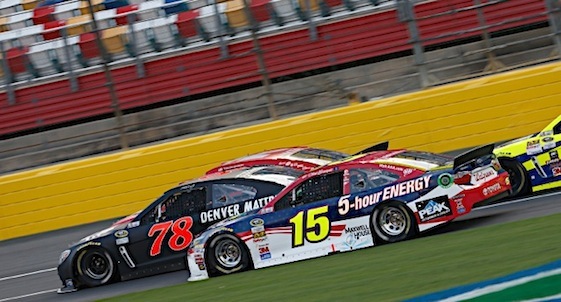 Greg Biffle of Roush Fenway Racing and Clint Bowyer of Michael Waltrip Racing drove their way into the All-Star event at Charlotte Motor Speedway by winning segments of the Sprint Showdown. Stewart-Haas Racing’s Danica Patrick earned her berth by way of the fan vote. Biffle led every lap of the caution-free first 20-lap segment of Friday night’s Sprint Showdown. Bowyer needed an early caution in the second segment to validate crew chief Brian Pattie’s four-tire call. None of the drivers have won a points race this season and Bowyer and Biffle have both expressed frustrations at times. Biffle, who put a Roush Fenway Racing car into the Sprint All-Star Race for the 16th straight year, ran away from the rest of the field in the first segment, beating Bowyer to the stripe by 1.583 seconds, and took his car to the garage. “I’m really excited,” said Biffle, who started second and traded paint with pole winner Paul Menard before assuming the top spot on the first lap. “We’ve worked really hard and we had good track position. We qualified well. It seems like we’re getting our cars a little bit better. Martin Truex Jr. was one of four drivers who changed two tires during the break between segments, and the driver of the No. 78 Furniture Row Racing Chevrolet took the lead after close-quarters racing to start segment No. 2. But a caution for J.J. Yeley’s spin out of Turn 4 slowed the field on Lap 22, and put Bowyer in position to take advantage of his four fresh tires. After two laps of breathtaking three-wide racing, Bowyer surged past Truex and Kyle Larson to take the lead for good. His winning margin over second-place Menard was 1.521 seconds, as Truex fell back to third and Larson pitted under green with a cut tire. (28) Alex Kennedy #, Chevrolet, 40, . Average Speed of Race Winner: 102.37 mph. Time of Race: 00 Hrs, 35 Mins, 10 Secs. Margin of Victory: 1.521 Seconds. Caution Flags: 2 for 0 laps. Lap Leaders: 4; G. Biffle 1-20; M. Truex Jr. 21-22; K. Larson 23; C. Bowyer 24-40. Leaders Summary (Driver, Times Lead, Laps Led): G. Biffle 1 time for 20 laps; C. Bowyer 1 time for 17 laps; M. Truex Jr. 1 time for 2 laps; K. Larson 1 time for 1 lap.